When is Eid in 2018? 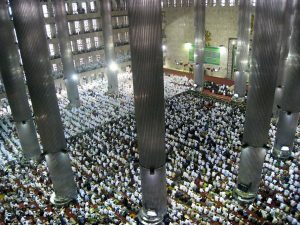 Thousands of Indonesian Muslims congregrate during Eid al-Fitr mass prayer in Istiqlal Mosque, the largest mosque in Southeast Asia, located in Central Jakarta, Indonesia. Image via Gunawan Kartapranata/Wikimedia Commons. The Muslim celebration of Eid al-Fitr – the festival of breaking the fast – will begin with the sighting of this month’s young moon in the west after sunset. Eid al-Fitr marks the end of the holy month of Ramadan. It’s always on the same day of the Islamic calendar, a lunar calendar, but the date varies from year to year on the more commonly used Gregorian calendar, a solar calendar. The date of Eid al-Fitr also typically varies from country to country, depending on whether the moon has been sighted. In 2018, much of the world’s Muslim community will celebrate it on June 14, although – for countries just west of the International Date Line, for example, countries in far eastern Asia – the date will likely be June 15. In actuality, the date of Eid is set by Muslim clerics. My apologies to that community if I’m wrong about the date of Eid for any particular country. My expertise isn’t Eid by any means, but instead young moon sightings. Every month, the date of a young moon sighting depends on the date and time of new moon. This month’s new moon falls on June 13 at 19:43 UTC (Coordinated Universal Time). Note that UTC used to be called GMT (Greenwich Mean Time). Nowadays UTC, not GMT, is the time standard. Translate UTC to your time. Please look below for more about expected young moon sightings this month, and Eid in 2018. Read more: How is the date of Easter determined?